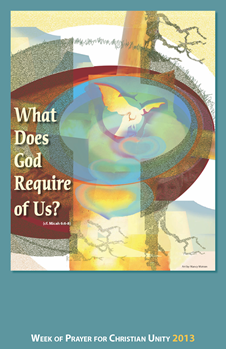 Introduction to the Theme: What Does God Require of Us? The Church Unity Octave was first observed in January, 1908. Celebrated in the chapel of a small Atonement Franciscan Convent of the Protestant Episcopal Church, on a remote hillside fifty miles from New York City, this new prayer movement caught the imagination of others beyond the Franciscan Friars and Sisters of the Atonement to become an energetic movement that gradually blossomed into a worldwide observance involving many nations and millions of people. To fully appreciate this stream that had been fed by some and had converged with others in the historical development of the Week of Prayer for Christian Unity, we will note some aspects of the movement's early history. Two American Episcopalians, Father Paul James Wattson and Sister Lurana White, co-founders of the Franciscan Friars and Sisters of the Atonement, were totally committed to the reunion of the Anglican Communion with the Roman Catholic Church. As such, they started a prayer movement that explicitly prayed for the return of non-Catholic Christians to the Holy See. Needless to say, such an observance would attract few of our separated brothers and sisters except for a small number of Anglo-Catholics and Roman Catholics themselves. This idea of a period of prayer for Christian unity originated in a conversation of Fr. Wattson with an English clergyman, Rev. Spencer Jones. In 1907 Jones suggested that a day be set aside for prayer for Christian unity. Fr. Paul Wattson agreed with the concept but offered the idea of an octave of prayer between the Feast of St. Peter's Chair on January 18 and the Feast of the Conversion of St. Paul on January 25. When Fr. Paul and Sr. Lurana became Roman Catholics, Pope Pius X gave his blessing to the Church Unity Octave and in 1916, Pope Benedict XV extended its observance to the universal church. This recognition by papal authority gave the Octave its impetus throughout the Roman Catholic Church. Until his death in 1940 Fr. Wattson promoted the Church Unity Octave, later known as the Chair of Unity Octave to emphasize its Petrine focus, through his magazine, The Lamp. What were some of the important historical antecedents to this octave of prayer? Certainly in the 19th century, the desire for Christians to pray together was part of the spirit of the age among those alarmed by the divisions which weakened the power of Christian witness. In 1846, for instance, the Evangelical Alliance was established in London and had developed both international and inter-church connections. Ruth Rouse noted that it was “the one and only definitely ecumenical organization . . . which arose out of the Evangelical Awakening in the 19th century” (A History of the Ecumenical Movement: 1517-1948). The concept of unity espoused in their constitution was union among Christian individuals of different churches for renewal in the Spirit; they would not deal with the question of the reunion of churches. The Alliance set aside one week beginning on the first Sunday of the year, for united prayer by members of different churches to pray for renewal in the Spirit. The Association for the Promotion of the Unity of Christians was founded in 1857 with Anglican, Roman Catholic and Orthodox participation. Its purpose was “for united prayer that visible unity may be restored to Christendom.” Unfortunately Rome withdrew its support for the Association. The problem, of course, was not the act of prayer in itself as much as the questions that surfaced concerning the nature of the church and the nature of the unity being sought through prayer. This difficulty would not begin to be resolved until almost the middle of the 20th century. It is noteworthy that the popes had urged Roman Catholics to pray for Christian unity but from the particular stance of return to the Roman Catholic Church. In 1894 Leo XIII encouraged Catholics to recite the rosary for the intention of Christian unity. Again, in 1897, he decreed in Provida matris that the days between Ascension and Pentecost should be dedicated to prayer for reconciliation with our separated brethren. In his encyclical Divinum illud, Leo sought to establish this practice of prayer as a permanent feature of the Roman Catholic Church. The Lambeth Conferences during this period also promoted prayer for Christian unity. Rouse notes that the second conference of 1878 was typical of the concern of Anglicans for reunion. At that conference, the bishops spoke of their desire that the conference support the observance of a season of prayer for the unity of Christendom. In 1913 the Faith and Order Commission of the Protestant Episcopal Church published a leaflet promoting prayer for unity on Whitsunday and in 1915 published a Manual of Prayer for Unity. The preparatory Conference on Faith and Order at Geneva in 1920 appealed for a special week of prayer for Christian unity ending with Whitsunday. Faith and Order continued to issue “Suggestions for an Octave of Prayer for Christian Unity” until 1941 when it changed the dates for its week to that of the January Octave. In this way, Christians, who for reasons of conscience, could not join with others in prayer services could share in united prayer at the same time. These various efforts while not attaining wide observance among the churches was to pave the way for the Week of Prayer for Christian Unity which came to be observed widely throughout Christendom. In 1935 Abbé Paul Couturier, a priest of the Archdiocese of Lyons, sought a solution to the problem of non-Roman Catholics not being able to observe the Octave of Prayer for Christian Unity. He found the solution in the Roman Missal as the Association for Promotion of the Unity of Christians had done seventy-eight years earlier in England. Couturier promoted prayer for Christian unity on the inclusive basis that “our Lord would grant to his Church on earth that peace and unity which were in his mind and purpose, when, on the eve of His Passion, He prayed that all might be one.” This prayer would unite Christians in prayer for that perfect unity that God wills and by the means that he wills. Like Fr. Paul Wattson, Abbé Couturier exhibited a powerful passion for unity and had sent out “calls to prayer” annually until his death in 1953. It is sponsored by the Commission on Faith and Order of the World Council of Churches and the Pontifical Council for Christian Unity. On a national basis, materials for the celebration of the Week of Prayer are the work of Graymoor Ecumenical & Interreligious Institute in collaboration with the Commission on Faith and Order of the National Council of Churches and the Roman Catholic Bishops' Commission for Ecumenical and Interreligious Affairs. The theme for the Week of prayer for 2013 is the simple question from Micah 6:6-8: “What is required of us?” The World Council of Churches invited the Student Christian Movement of India to prepare the resources for the Week of Prayer for Christian Unity and the Movement involved the All India Catholic University Federation and the National Council of Churches in India. The context of India for the theme is an apt one in that the quest for Christian unity cannot be disassociated from issues of social injustice. The Dalits of India are the people most affected by casteism, a rigid form of social stratification. The effects of this treatment on the Dalits has been social marginalization, political under-representation, economic exploitation and cultural subjugation. The situation facing the people of God in Micah is similar to that of the Dalit community in India. Micah reminds us that true faith in God is inseparable from the desire for personal holiness and social justice. As Christians we are reminded that our own reconciliation in Christ calls us to “do justice, love kindness and walk humbly with our God”. If we speak and act for Christian unity, we must speak and act for social justice.